The Indians and catcher Yan Gomes have agreed to terms on a six-year, $23 million extension that will keep Gomes under team control throughout the 2019 season, covering his two pre-arbitration seasons, three arbitration years, and a year of free agency. Last season, Gomes hit a triple-slash line of .294/.345/.481 with 11 home runs and 38 RBI in 322 plate appearances (88 games). He posted a 2.9 oWAR, 1.8 dWAR, and 4.2 overall WAR in 79 starts at catcher. Overall, Gomes has posted a 117 OPS+ in 131 career games. Gomes will become the full-time starter at catcher this season, after being a plus player behind the dish and at the plate. The Indians will likely move Carlos Santana (last season&apos;s platoon catcher with Gomes) to designated hitter. Gomes&apos; extension will keep him as the Tribe&apos;s starting catcher for years to come. Outfielder Mike Trout has signed a six-year contract extension on Friday with the Los Angeles Angels. The extension is worth $144.5 million and will kick in following the 2014 season, which Trout will make $1 million. He becomes a free agent again just before his age-29 season, when he is still in his prime. He could get his huge deal then. It seems that the negotiating process did not take long. The Angels initial offer to Trout was over six-years and worth $140 million, and after Trout countered with $153 million, they agreed upon the extension that he signed on Friday. This deal is the second-largest for any player with less than three years of service time (Buster Posey: eight years, $167 million). Nonetheless, Trout's deal tops Posey's in average annual value by about $4 million. Trout is one of the best (if not the best) players in all of the Major Leagues. In his two years, seventy days of service time, Trout has been to two All Star games, won two Silver Sluggers, was the American League Rookie of the Year, and has finished second in the MVP voting twice. In 2013, Mike Trout was the anchor in the Los Angeles Angels lineup. In 157 games, the Millville, New Jersey native hit a triple-slash line of .323/.432/.557 with 27 home runs and 97 RBI in 716 plate appearances (179 OPS+). Trout led the American League in walks (110), as his OBP took a 33 point jump from his Rookie of the Year campaign in 2012. The advanced metrics prove that Trout could have easily beaten out Miguel Cabrera for the MVP last season, posting a 8.9 WAR (Baseball-Reference) and a 9.7 oWAR. However, the dWAR statistics wasn't as favorable, finishing out at a -0.9 mark. Trout's career has been a great one. In 336 games, he has posted a .314/.404/.544 triple-slash line with 62 home runs and 196 RBI in 1,490 plate appearances. In 2012, along with his 30 home run power, Trout also led the American League in stolen bases (49). The double-threat, along with some average to above average defense, could make Trout one of the best players baseball has seen in a long time. Although the deal is considered a team friendly deal, Trout still has not been in the Major Leagues long. He will still get to cash in on his next deal. He hits the free agent market in 2020, and will almost surely be in his prime then. Trout's deal helps get the Angels back into contention, but also keeps in mind that he could still get paid a lot of money on his next contract. Hopefully, we will just get to watch some more great years of Mike Trout. A player who fails his first test will be suspended for 80 games, his second offense will be a suspension of 162 games, and his third suspension will be a banning from baseball. Before, baseball had suspensions of 50 games, 100 games, then a lifetime ban. These harsher penalties will hopefully lower the rate of suspensions. The number of urine samples will jump from 1,400 to 3,200. Players that get suspended once are subject to nine unannounced tests every season, six urine tests and three blood tests. Players who get suspended in a season will not be allowed to participate in that season's postseason. Many were upset following Jhonny Peralta and Nelson Cruz being allowed to participate in last season's postseason following their suspensions. Baseball Commissioner Allan H. (Bud) Selig said: "Major League Baseball is proud to announce some of the most significant improvements that we have made to our Program in recent years. Although we had the strongest Program in professional sports before these changes, I am committed to constantly finding ways to improve the Program in order to eradicate performance-enhancing drugs from the game and for MLB to serve as a model for other drug programs. I want to express my appreciation to the Players for being proactive and showing remarkable leadership in producing the new agreement. I commend them for both their foresight and their creativity throughout this process, and for strongly sharing our desire to improve what is already the toughest drug program in sports." MLBPA Executive Director Tony Clark said: "Experience proves that increased penalties alone are not sufficient; that's why the Players pushed for a dramatic increase in the frequency and sophistication of our tests, as well as comprehensive changes in a number of other areas of the program that will serve as a deterrent. Make no mistake, this agreement underscores the undisputed reality that the Players put forward many of the most significant changes reached in these negotiations because they want a fair and clean game." The Detroit Tigers have agreed to terms with star third baseman Miguel Cabrera on a monster extension. On top of a former extension where Cabrera will make $44 million over the next two seasons, Cabrera has agreed to another extension over eight-years worth approximately $248 million and with two vesting options, which will keep him under team control through the 2025 season. The $31 million average annual value on Cabrera's contract shatters the former average annual value record of $30.7 million, set by Clayton Kershaw's extension with the Dodgers earlier this offseason. The Tigers' third baseman has been to eight All Star games, won two American League MVPs, and five Silver Sluggers. His career has included a triple-crown season, the first since Carl Yastrzemski in 1967, and only the 16th ever. The 31-year-old to be won the American League Most Valuable Player award in 2013, hitting a triple-slash line of .348/.442/.636 with 44 home runs and 137 RBI (187 OPS+) in 148 games. He posted marks of a 7.5 WAR and a oWAR of 9.2, proving that he is one of the best players in not only the American League, but in all of the Major Leagues. That is why he is worth $292 million over the next ten seasons. Cabrera's mastery has come throughout his entire time in his professional career. After being signed by the then Florida Marlins in 1997, Cabrera sped to the Major Leagues, appearing in his first MLB game in 2003. Before the 2008 season, Cabrera was traded to the Detroit Tigers, and since then he has posted a .327/.407/.588 slash-line with 227 home runs and 737 RBI in 940 games. Overall, Cabrera has a career slash-line of .321/.399/.568 with 365 home runs and 1,260 RBI. 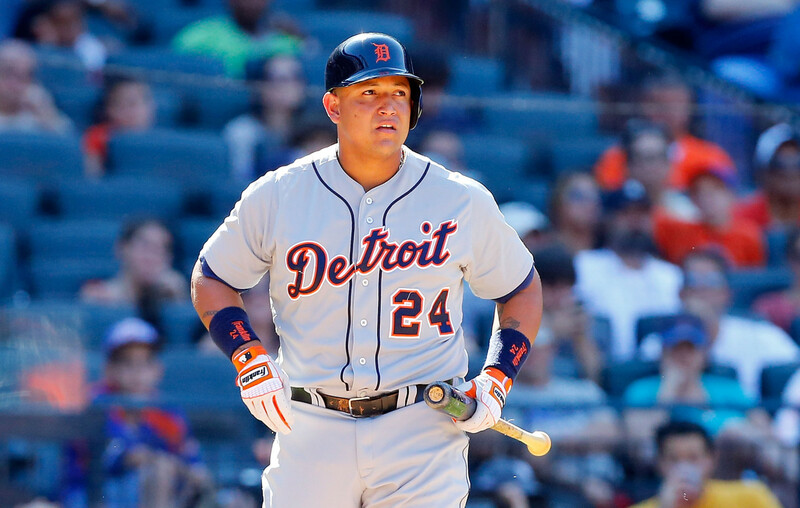 Although this contract seems a little outrageous, especially after Cabrera missed some time during the season due to lingering injuries, the Tigers hope that a move back to first base will keep Cabrera in their lineup full time beginning in 2014. The Tigers traded 2013 first baseman Prince Fielder to the Texas Rangers in order to open a spot for Nick Castellanos, a top third base prospect in the organization. Cabrera's legs will have less stress at first than at third. Initial reactions have thought that this deal is a bad one, as we have seen deals that have kept older players (Cabrera will be 40 when his guaranteed contract expires) under contract well past their peaks (Ryan Howard is a prime example). But, if there is one guy that truly deserves this type of a contract, it is Cabrera. He has dominated pitchers throughout his 10 years, 101 days of service time in the Major Leagues. The Tigers hope that he will continue to for his next 10 years as well. Starling Marte and the Pittsburgh Pirates have agreed upon an extension that will keep Marte in Pittsburgh through at least the 2019 season, after the sides agreed upon a six-year, $31 million deal yesterday. The deal includes two option years, and will kick in during the 2014 season, putting Marte under team control throughout 2021. The deal had been rumored to be close over the past week, and was only about time before the two sides agreed upon a pact. At only a $5.167M AAV, Marte earns the money he deserved, while the Pirates did not overpay the outfielder. It seems that Marte will continue to have a great situation in Pittsburgh with the Pirates. In 2013, the primary left fielder hit .280/.343/.441 with 12 home runs and 35 RBI (122 OPS+) in 135 games. In his first full season, Marte added 5.5 WAR (worth about an All Star), 3.1 oWAR, and a 1.8 dWAR. Basically, this means that Marte is an all-around player. Last season, Marte made $500,000, and will be taking a huge pay raise this upcoming season. The deal makes sense for both sides; Marte gets his contract, while the Pirates get an All Star caliber player for a long time at a great deal. Marte will stay in Pittsburgh and continue to provide for the Pirates in 2014 and beyond.